The destruction and desolation of what was once the busy Christian Iraqi town of Qaraqosh near Mosul has been captured by a Ruptly camera crew. The 360° video gives you the opportunity to walk its haunting, rubble-strewn streets. The town was seized by Islamic State (IS, formerly ISIS/ISIL) in 2014 and liberated in the ongoing counter-terrorism campaign. Qaraqosh is now largely in ruins, with many of the houses recently destroyed in coalition airstrikes. Fortunately, nearly all residents fled Qaraqosh even before the arrival of IS in the area. 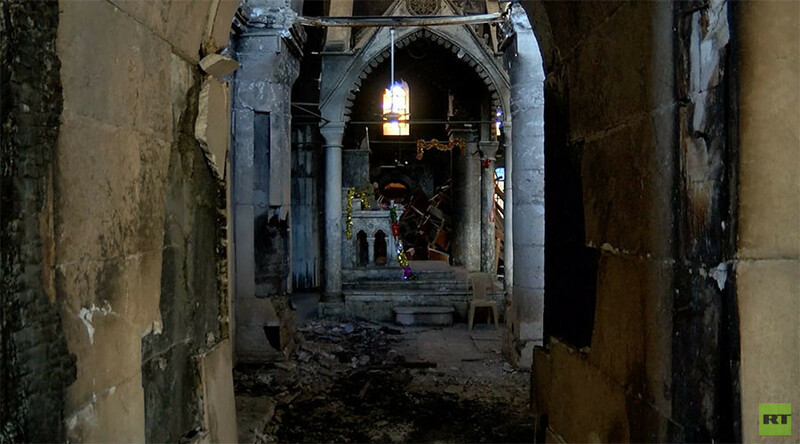 Islamists used the town as one of their outposts, and reportedly turned the Church of St Mary al-Tahira into a shooting range. They tore down crosses, burned books, and even tried to burn down the whole church. Qaraqosh, also known as Bakhdida, is only 25 kilometers from Mosul, the IS stronghold in Iraq. The siege of Mosul, which began in October last year, comprising Iraqi troops backed by Kurdish Peshmerga forces, Shiite militias, and the US-led coalition, has already caused hundreds of civilian deaths and displaced 200,000 people.